The Medical Clinic of Bellaire is located within easy distance of some of the finest medical hospitals in the world. But it is our hope that our patients will never require the expertise to be found in these institutions. Our staff maintains a personal and caring relationship with our patients, and we consider them a part of our extended family. Here is a little bit about "Who We Are" at the Medical Clinic of Bellaire. 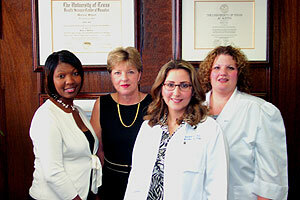 Esther Guy, M.D., received her medical degree from the University of Texas Health Science Center in Houston. Dr. Guy followed that with a three year stay at the Baylor College of Medicine to fulfill the requirements for a Residency in Internal Medicine. Dr. Guy is Board Certified in Internal Medicine through the American Board of Internal Medicine and has been in practice in Houston for four years. Maude Burris, the Office Manager for the Medical Clinic of Houston.